FamilyFun magazine has three cute and easy (and in some cases, tasty!) 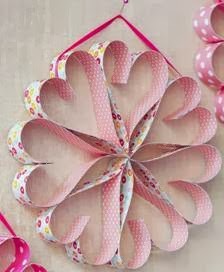 crafts for families to create together this Valentine’s Day.....especially last minute! Hersey kiss mice, an M & M board game, and more! Check out the three ideas below that are perfect for celebrating the day of love! My kiddos are going to have a great time making these! Print the ear and foot templates on cardstock and cut out the shapes. Remove the paper flags from two Hershey’s Kisses. Fold the feet where shown on the template, then use tacky glue to sandwhich the feet and ears between the Kisses. Glue a 4-inch length of gray yarn to the underside of the back kiss. Add googly eyes. 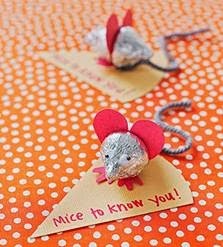 Attach the mouse a cheese-shaped piece of card stock with a glue dot, then write a note. M&M’s serve as a sweet stand-in for X’s and O’s in this packaged card-and-game combo. (For a sugar-free version, use buttons instead of candy). Trim card stock into a 4- by 6-inch rectangle. 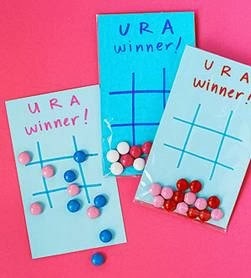 Use a marker to draw a tic-tac-toe board in the center and add a message at the top, such as “U R A winner” or “I’m game to be your friend!” Slide the card into a 4- by 9-inch clear treat bag (available at craft stores). Add several M&M’s, providing an equal number of two colors. Fold the top of the bag behind the card and seal it with tape. Pretty paper and glue dots are all you need to make a heartwarming wreath to hang anywhere that needs a little love. *Disclosure: I have not been compensated in any way for this post. All opinions expressed here are entirely my own and may differ from others'. valentines day gifts is an exclusive online gifting experience specialising in luxuriously packaged gift boxes containing high quality intimate apparel including lingerie.